We know that we need protein in order to repair damage after a work out, we know that our muscles are MADE of protein, but is there any benefit to the masses of products which are available over the counter, as opposed to say buying simple tins of tuna and chicken breasts, and what about when to use the protein after a workout? There is also the long-standing mantra advising to eat the protein 20mins after a workout – Let’s take a look at the evidence too! When reading around scientific literature for a subject, it’s important to know specifically what you are looking at, and the quality of the information you get from that search. When studies are conducted looking at protein in the diet and the effect on muscles, they tend to be performed in controlled environments with weight machines. As such there are very, good quality, cycling/running specific studies. Those studies with robust, clear data tend use individuals doing controlled, resistance exercises, mainly focusing on leg based exercises, such as leg extensions. 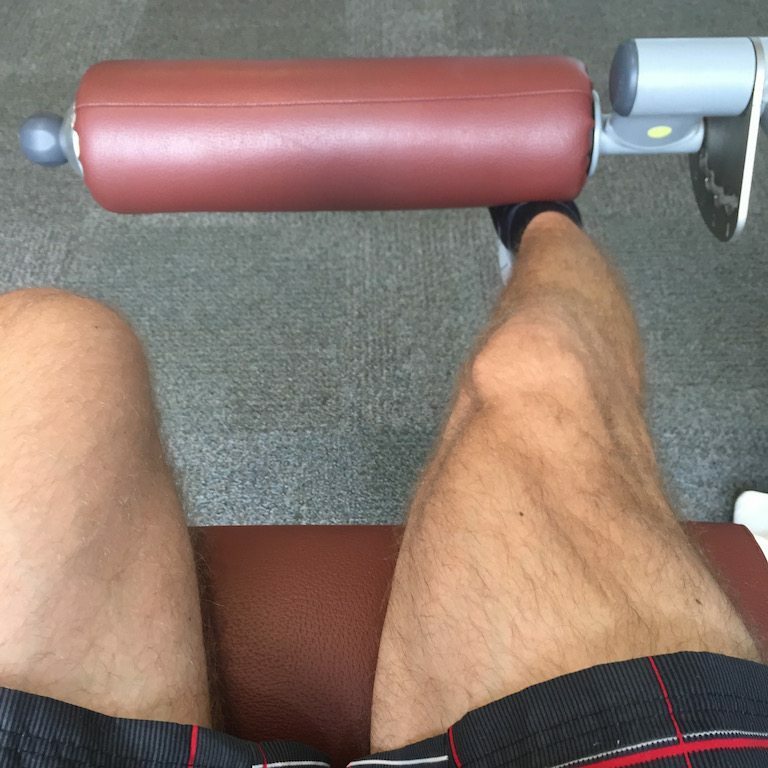 Leg extensions are used as it gives the researchers a nice big muscle, which develops rapidly over a period of weeks, but more importantly is very close to the surface, and has very few nerves and vessels where biopsies are routinely taken from. You can then run a gamut of chemical and DNA test to monitor the muscle grown, and it’s response to test protein/placebo supplements. 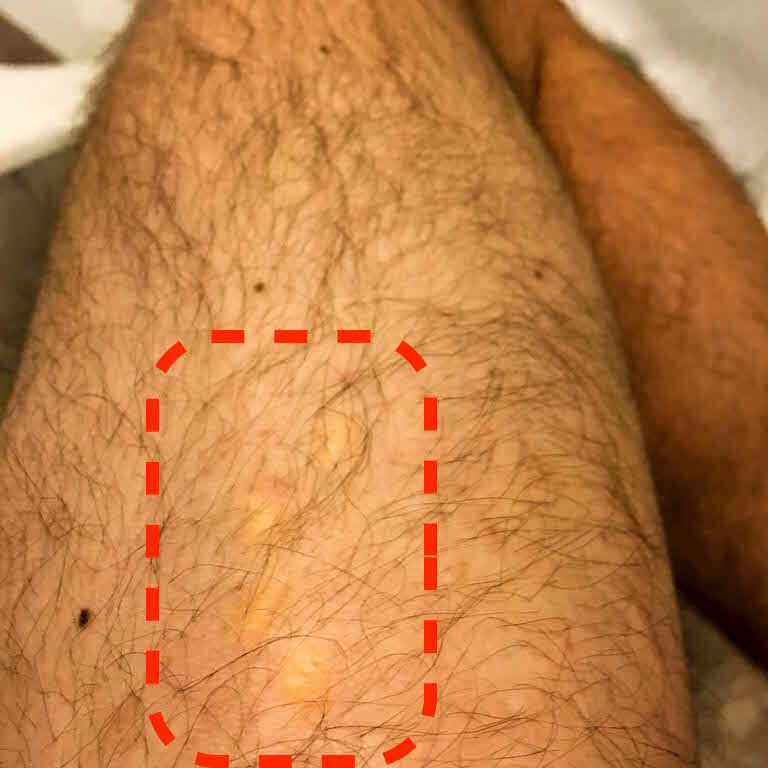 Yes, those are my scars, in the red box, from muscle biopsies involved in a muscle growth study, never let it be said that I don’t do my bit of science! Or more likely that students will do anything for free protein shakes, and six weeks free access to an Olympic Team personal trainer at the university gym! So while the papers are usually based on resistance exercises, the information that I’ve pulled out should apply to any sport where you are looking to strengthen and develop your muscles. Protein, Amino Acids…Basically your biological Lego kit! So in 2008, American Society for Nutrition did a publication suggesting that it is amino acid availability, rather than protein ingestion which affects muscle growth and albumin synthesis after resistance exercise. 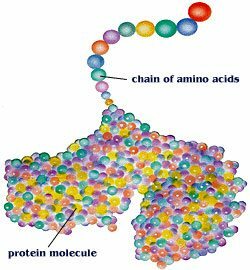 Before we go any further, let’s go right back to the underlying biology: Amino acids are the individual building blocks, which link together to form proteins, which are then used as the building blocks for myofibrils, which in turn bunch together to form muscle fibres. 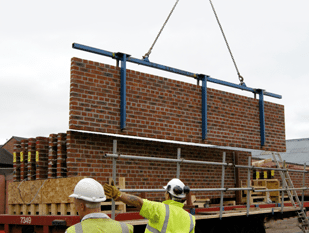 Think of it like the bricks that make up the pre-fabricated walls, that are then used in the construction of the whole building. SO what did they actually in this study? The anabolic effect (the ability to build molecules, which can be used in muscle construction) is increased in resistance exercise (mainly weight lifting). Muscle protein synthesis – muscle growth, in response to strength exercises responds in a dose-dependent manner, following the provision of essential amino acids. i.e. the breakdown products of protein. The critical information for me was not about muscle growth though, but that you can ingest too much protein, leading to its oxidation, and thus its lack of use. The paper showed that as you increase dietary protein, so too does muscle synthesis, but the growth, or possibly more accurately muscle protein synthesis cannot increase any further after you have consumed just 20g of protein orally. Oh, you can take it in, but it’s not going to do anything. But where does the essential amino acids (EAA) come into this? Well, the protein has to be digested, broken down into the amino acids to be reconfigured into your own muscles, so the study looked at the effect if you just provide the EAA. Maximal muscle synthesis was reached if you consume just 8.6g of EAA! Beyond that, the effect is wasted. Frankly, I was amazed at both numbers, but if you look at the amount of protein contained in most supplements, they have about this 20g, although some manufacturers aggressively market other products as having greater amounts of protein. 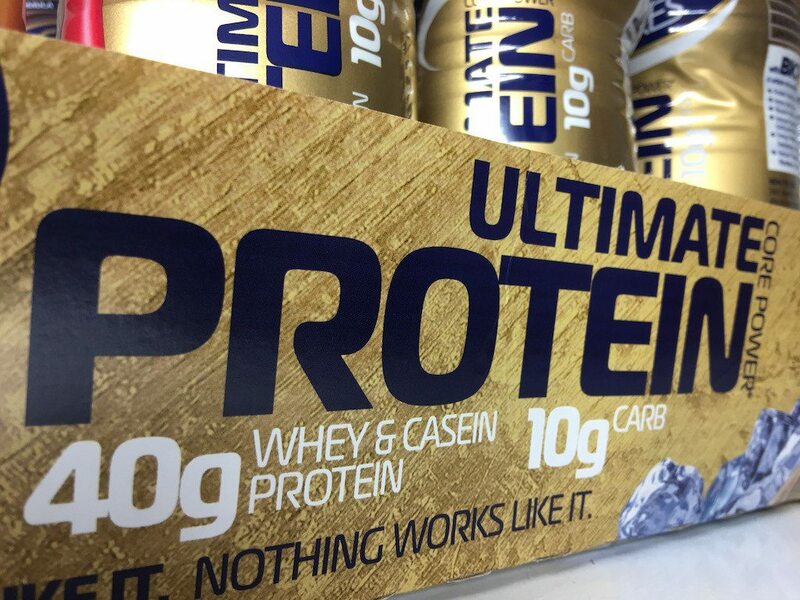 But that appears to just be a marketing hype, and a waste of protein after a workout. The study highlighted the fact that resistance exercises enhance the muscle synthesis for surprising 24hrs after exercise. So the question becomes, how many times in a day could an athlete consume the maximally effective 20g of protein, or 8.6g of EAA, to stimulate the muscle growth signals and maximise that training window? – Let’s just rephrase that: because of how the body deals with protein, excess daily consumption might actually make the body LESS efficient at processing the protein and converting it into muscle. – LESS appears to be apparently more! Yes there is the suggestion (there is that word again) that just EATING sufficient protein will also cause muscle growth, although they are also clear that taking protein after a workout will have an additive effect, although how much isn’t clear! 2) Supplements allow you to have a much greater control of your protein intake, but the form doesn’t really matter. 20g of protein is all you need, whether that’s chicken breast or a protein shake. Certainly, supplements, especially EAA where you’ll need much less to get the same effect, 20g vs 8.6g, can allow you to have even greater control over your diet, but then again there isn’t any significant benefit over real food. 3) The 20minute window doesn’t seem to have any direct evidence, but that taking protein immediately after exercise makes sense from a blood flow perspective if nothing else. 4) Consumption of protein within 5 hours of training is likely to aid recovery, if not necessarily having a maximal effect on muscle growth. So if that corresponds to going to sleep, great, but if not I’ll just be having a milkshake just for the taste! 5) Some people might show a benefit consuming protein supplements BEFORE exercise. Personally, however, tend to get a stomach cramp very easily if I eat before exertion, so I’ll be giving that one a pass.